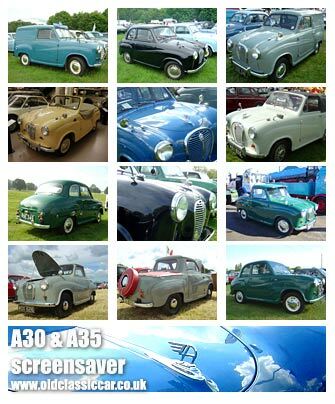 One of many classic car screensavers freely available on oldclassiccar.co.uk, is this the one that features the baby Austins of the 1950s, namely A30s and A35s, both saloon, car, pickup and even convertible versions! Twelve photographs feature in this screensaver, all taken by myself at shows and events in the UK. The A30 convertible, a BMC experiment, was seen at the Gaydon heritage museum, and the white A35 convertible at Weston Park in Shropshire. The latter was a home-made conversion, interestingly it featured the deep side sills modification as found on the pukka BMC A30 prototype/experimental car. Notes on how to download this screensaver below..